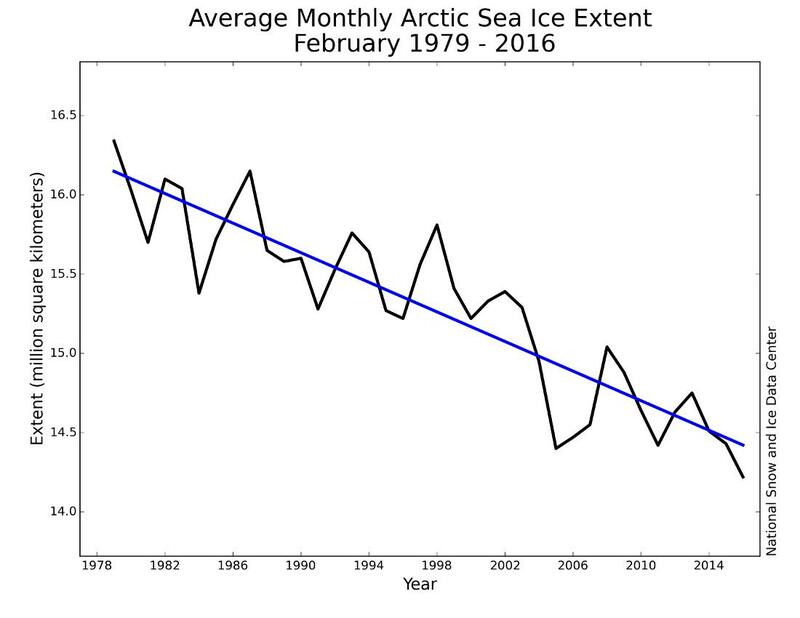 Arctic sea ice extent has been anomalously low this winter. The greatest anomalies are in the European sector, specifically in the Barents Sea. To what extent are the anomalies associated with warm temperatures? I spotted this, no idea what to make of it. You would think she and her denizens would therefore have been pleased when I attempted to explain to her what to make of it, but you would have been mistaken. The icing on the ad hominem cake was the aforementioned Anthony Watts driving by to accuse me of all sorts of nefarious activities without providing a single shred of evidence and then running for the hills when invited to actually prove his ludicrous allegations. Those dark areas between Svalbard and the North Pole are suddenly starting to look as though they represent reality rather than a mere “artifact”, although perhaps they are merely transient evidence of yet another Arctic “heat wave”? 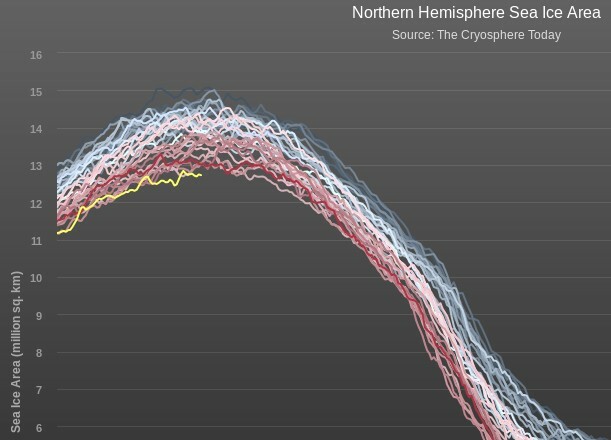 Arctic sea ice was at a satellite-record low for the second month in a row. 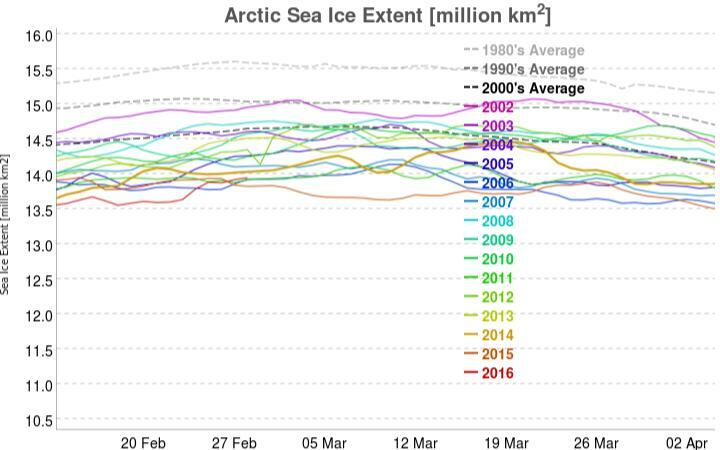 The first three weeks of February saw little ice growth, but extent rose during the last week of the month. NASA and NOAA announced that January 2016 was the ninth straight month of record-breaking high surface temperatures for the globe. 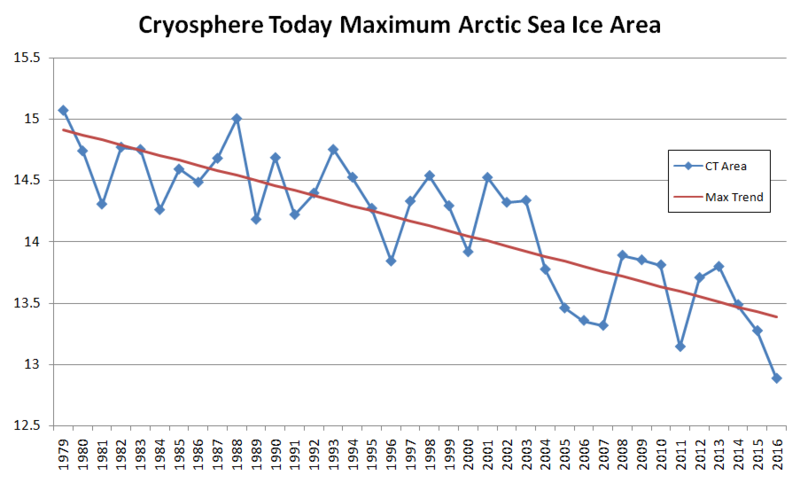 In terms of regional patterns, the Arctic stands out, with surface temperatures more than 4 degrees Celsius (7.2 degrees Fahrenheit) above the 1951 to 1980 average. 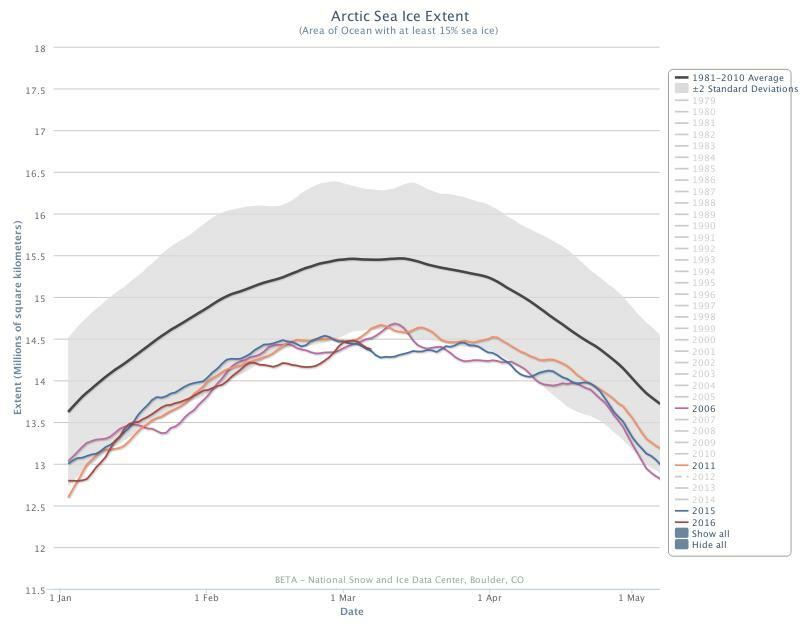 These high temperatures were in part responsible for the record low sea ice extent observed for January. 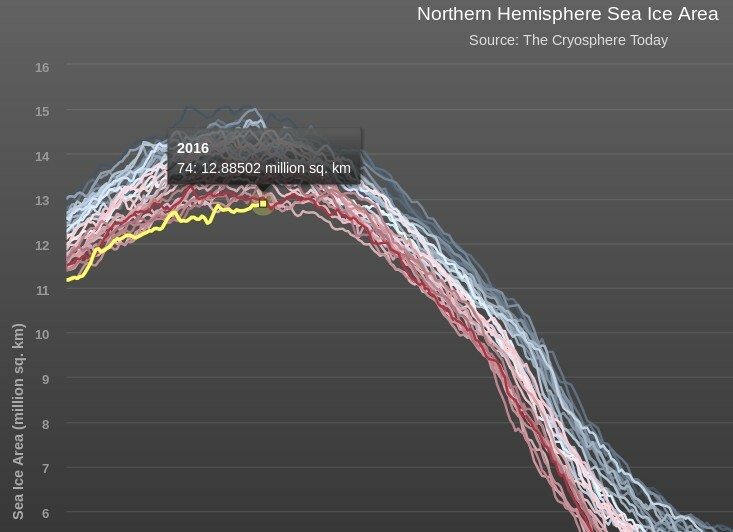 Persistent warmth has continued into February; air temperatures at the 925 hPa level were 6 to 8 degrees Celsius (11 to 14 degrees Fahrenheit) above the 1981 to 2010 average over the central Arctic Ocean near the pole. During the second half of January, an anti-cyclonic, or clockwise, circulation pattern developed in the Beaufort Sea, which subsequently strengthened and expanded to include most of the Arctic Ocean. 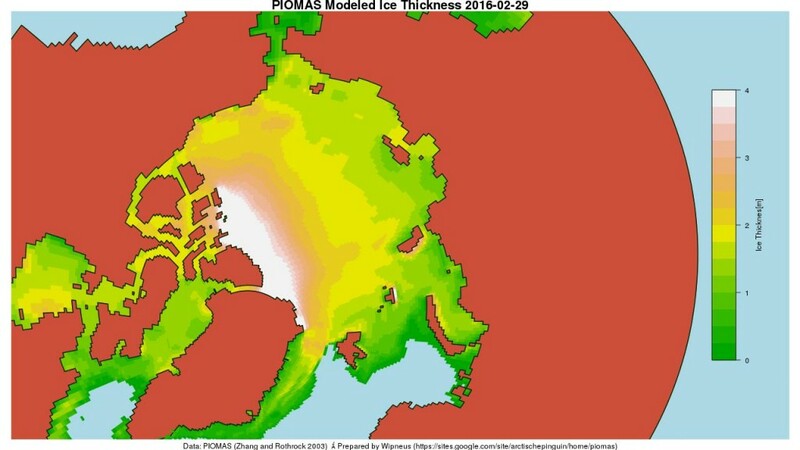 This has favored enhanced ice export out of Fram Strait, helping to flush old, thick ice out of the Arctic Ocean, leaving behind thinner ice that is more apt to melt away in summer. Whether this circulation pattern will continue and set the stage for very low September sea ice extent remains to be seen. The daily data shows 20.660 thousand km3 for 2016 day 60, compared to the “lowest *ever” level of 20.546 for day 60 of 2011. I am only a humble learner at ASIB and ASIF and have a sincere question. 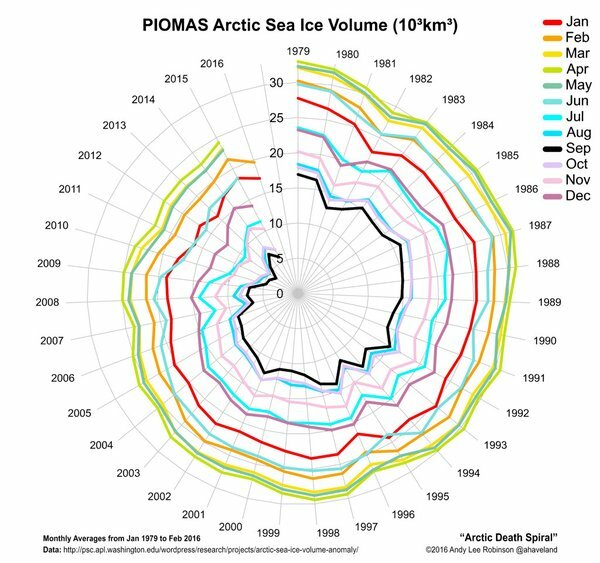 Given what we know of past pauses in the decline of ice volume, is it safe to say that volume could be decimated if the Arctic is subjected to another “perfect storm summer” similar to 2013? I suddenly have this strange feeling of déjà vu. In answer to your question, here’s another one! How do you define “decimated”? If it’s “less than September 2012” that is certainly feasible given that all the sea ice metrics are currently lower than on the same day of 2012. Not by a lot though. What with one thing and another I have to admit that I haven’t had a chance to compare snow cover yet though. 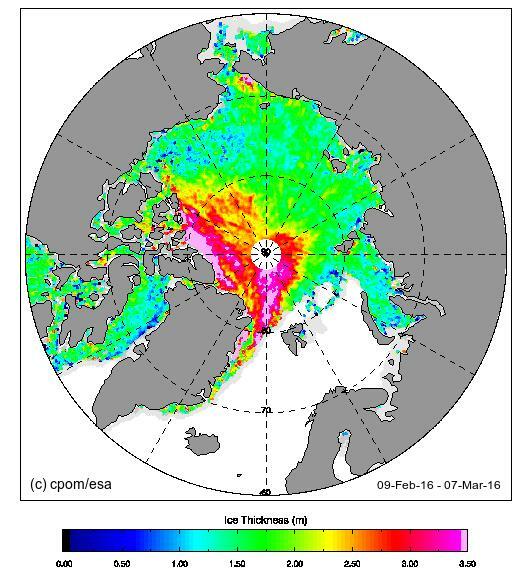 In addition the Beaufort Sea is lacking the thick ice of last year, currently at least. 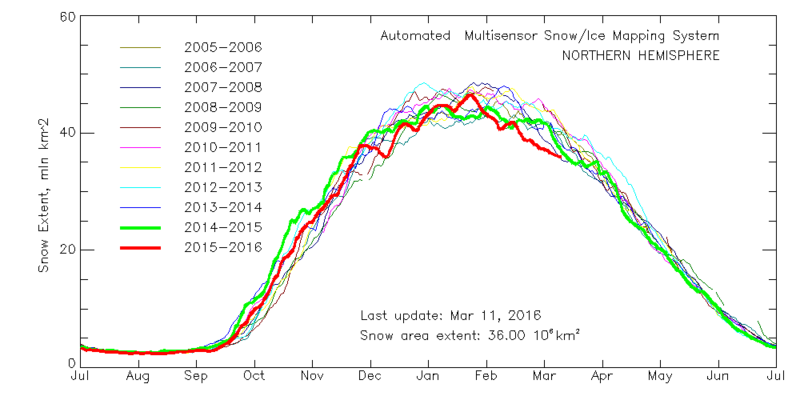 Nonetheless there’s still lots of that north of Greenland and the CAA, which will take lots of energy to melt. Why don’t you try posing your question again in 3 months time? 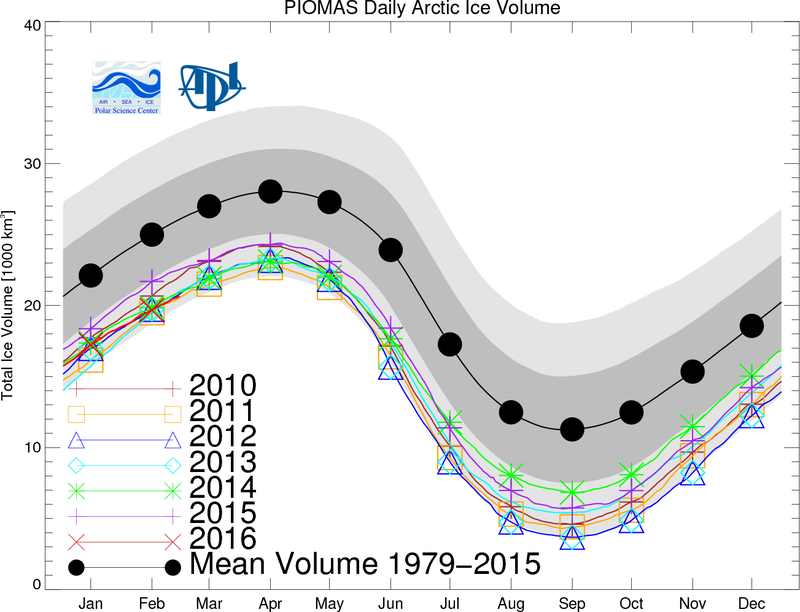 Decimated was referring to a similar percent loss in volume as compared with 2012, not the net volume of ice loss. That being the case, and pending reevaluation in June of course, it is certainly not beyond the bounds of possibility that by September 2016 the sea ice in the Arctic will be at least as “decimated” as it was in 2012. We’ve made a bold prediction over on Twitter! 12.885 million square kilometers. Can you see the big drop for last year (red line) in the middle of March? Expect the same tomorrow!